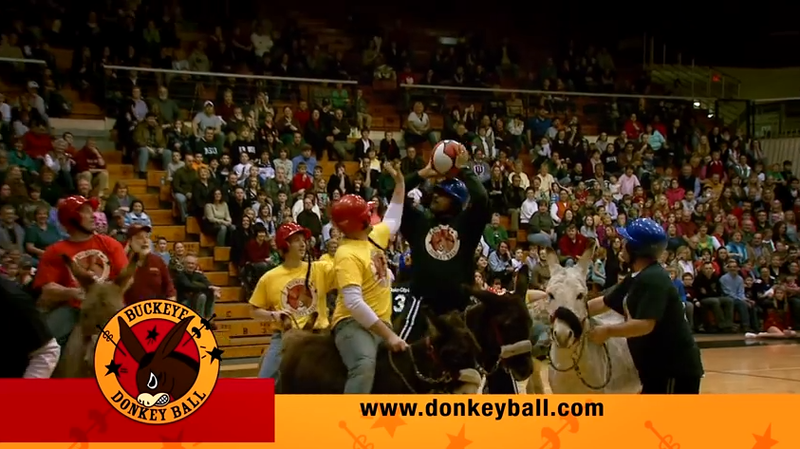 Ohio donkeyball ad: Buckeye Donkeyball is the state's most beloved pastime (VIDEO). With respect and admiration for Jonathan Chait’s “Life in Ohio, a Continuing Series” project, here’s a great ad for a Columbus, Ohio-based donkey rental service. You rent the donkeys to play basketball or baseball while riding on top of them—they’re sports donkeys. It’s funny because of the way he emphasizes the words donkey and donkeys every time he says them. These donkeys are ready to put on a show! The only sad part of the story is that since the donkeys are from Columbus they’ll eventually be declared ineligible when it comes out that athletic department tutors did all their homework for them even though they were majoring in something called Golf Awareness.